Public connections aren't encrypted which means anyone can access your information just by using packet sniffers. Only input information on a Public connection that you wouldn't mind the person next to you seeing. Malware comes in many forms, Third party payment apps are a big offender. Check out the reviews, Google for any complaints and when in doubt use apps provided by your bank, credit card company Paypal or a large retailer like Amazon or Target. Use Apple App Store, Google's Android Market and Amazon's App Store for Android. Apple and Amazon are proactive in their vetting process. The s in https:// is most important. It means the site has a SSL (secure socket layer) Channel which will protect your sensitive payment information. Hackers can easily steal information on http:// sites. Where Can You Dig for Semiprecious Stones? 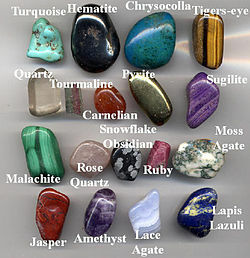 Spending a few hours digging for semiprecious stones can be a fun family activity for a day trip or a vaction. You'll have to pay the cost for permits and entrance fees, as well as fees for buckets of ore or other materials, but you keep what you find. Many locations in the United States allow you to practice prospecting. Visit the town of Herkimer, New York, to hunt for Herkimer diamonds, which are a type of quartz crystal. The mine has an on-site museum and restaurant and offers nearby camping and a motel. Admission includes use of a hammer, but not safety glasses or other tools. Search for more than 60 varieties of gemstones at the Emerald Hollow Mine in Hiddenite, North Carolina. The mine has emeralds, sapphires, aquamarine and garnets. This facility rents the tools you will need at a low cost and gives you the choice of swishing through ore (known as sluicing) or sifting material from creek beds. For the more independent gem hunter, there is the Diamond Hill Quartz Mine in Antreville, South Carolina, where patrons can, with permission, explore the property on their own to search for minerals. At Gold n Gem Grubbin' in Cleveland, Georgia, you can pan for gold, gemstones and historical artifacts in the creek or sit on the sluice line and sift through ore. Hunt for boulders with veins of rose quartz the Hogg Mine in Lagrange, Georgia, which also requires you to bring your own equipment or purchase it on site. Nevada's Virgin Valley is home to opal mines, several of which are open to the public. The closest town to these mines is Denio, Nevada, in the northwest corner of the state. Bonanza Opals, Rainbow Ridge Opal Mine and Royal Peacock Opal Mines are three mines in that area that offer public admission. The opal mines tend to charge higher fees than those for other semiprecious stones. You will need your own equipment at these facilities. Topaz Mountain, in Juab County, Utah, is said to be a great location to collect bits of the Utah state gem, topaz. You can find clear topaz laying on the open ground, or you can dig for amber-colored topaz in cracks in the rock using a simple tool, such as a screwdriver. Jade can be found along California's coast on the beaches just south of Big Sur, along the scenic coastal U.S. Highway 1. Beaches include Jade Cove, Gem Cove, Willow Creek and Sam Simeon. Public mining facilities are typically far outside cities. If you're not planning a trip to any of the areas listed above, check with your hotel or the local visitor's bureau in the state you are traveling to seek out other options.